After growing up on Hermitage Court in Forest Hills, Charles R. Skinner Jr. bought land not far away on Sycamore Street to build his house. The timing was fortuitous, Skinner, who went by “Chas,” bought the lot at 1032 in May of 1945. World War II ended in the beginning of September, and the next week he married Mary Powers Brooks. By 1946, they had their home built. Forest Hills, like much of Durham, experienced a new wave of construction after the war due to a pent up demand for housing. The upscale neighborhood was originally laid out and developed in the late 1920s. The Depression years were hard on the development and the original development company went under. Many lots remained vacant until the late 1930s when new home construction began to pick up again. Then, with the war, construction stopped again as materials were diverted to the war effort. The houses that were built right after the war were designed to maximize efficiency and minimize use of expensive and difficult to obtain materials. The lots that were developed later in Forest Hills tend to be smaller and have a more urban feel. 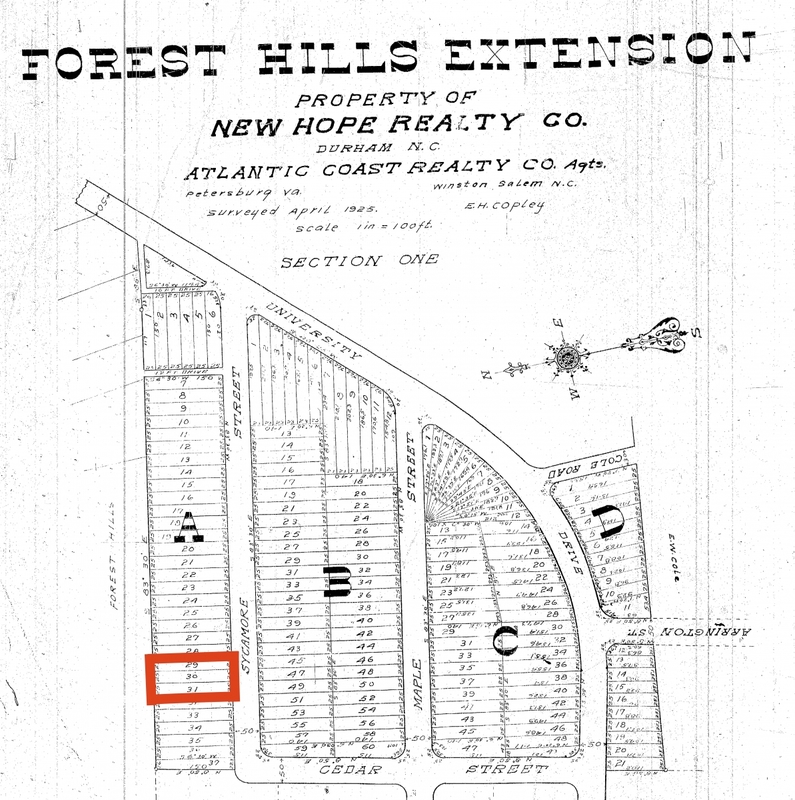 The Skinner House lot combined three-plus parcels as originally laid out by this Forest Hills 'Extension' developer, giving a sense of the intended contrast to the size of lots and homes in the parts of the neighborhood built earlier to the north (County Register of Deeds). The Colonial and Tudor Styles that had been so popular in Forest Hills before the war were replaced by simplified Colonial Revivals, Minimal Traditional, and Modernist homes. Style books of the time encouraged simple roof forms and materials, and discouraged any nonessential features or fussiness. They suggested that homes should be useful and simple and rooms should be scaled for maximum livability. Excess square footage should be omitted, hallways should be minimized, and on the exterior, a single siding material should be used to make a home appear larger. Detached garages also make a home appear larger and increase ease of use. Although 1032 Sycamore was never a typical entry-level home for the period, many of these postwar design dictates are evident in its layout and decoration. The house is a mixture of both colonial revival and minimal traditional styles. The exterior of the one-and-a half story side gabled home features a recessed entryway, a front bay window, and three gabled dormer windows. Several significant but discreet changes have been made to the exterior of the house since its original construction. The right recessed wing, connected to the house through a breezeway, was formerly a garage. The most significant change occurred in 1953 when the Skinners enlarged the living room the rear and added new living space above. These changes are nearly seamless. Only a slight bump in the ridge line in the roof and small differences in the left-hand dormer give the addition away. The bill for the work was nearly $5,000. In 1967, the Skinners enclosed the rear porch. It is now part of the kitchen. The home has several types of windows: steel casement windows in the upper dormer windows and wood six-over-six sash windows throughout much of the rest house, and a pronounced bay window in the living room. The interior of the house has gone through several renovations, but much of the original fabric remains. The wood floors, casework, doors, and door hardware are nearly all original. When the house was first built, the first floor featured an entryway with stairs to the second floor, separate dining room, kitchen, bedroom, and living room. The current owners have opened up the adjoining kitchen and dining space, and use the front bedroom as an office. The living room features a large bay window as well as original French doors to the rear yard. The fireplace is surrounded by a simple colonial style mantelpiece. The bathroom was updated by the current owners, but the location and size of the space remain. The upstairs features a master bedroom with a 1970s bathroom addition, two additional bedrooms, and a bath. The third bedroom is large in scale for a bedroom of the time and features a fireplace. The size of the gable dormer and the casement window in this bedroom differ slightly from the dormers and windows in the other bedrooms. This bedroom was created or enlarged in 1953 when the living room below was expanded and the roof over it was raised. Charles “Chas” Skinner, Jr., was in the insurance business. He began with Southern Fire Insurance Company which in time became Crum and Forster Insurance. The firm had elegant offices in a remarkable modernist office building on Broad Street. Duke now owns the building. 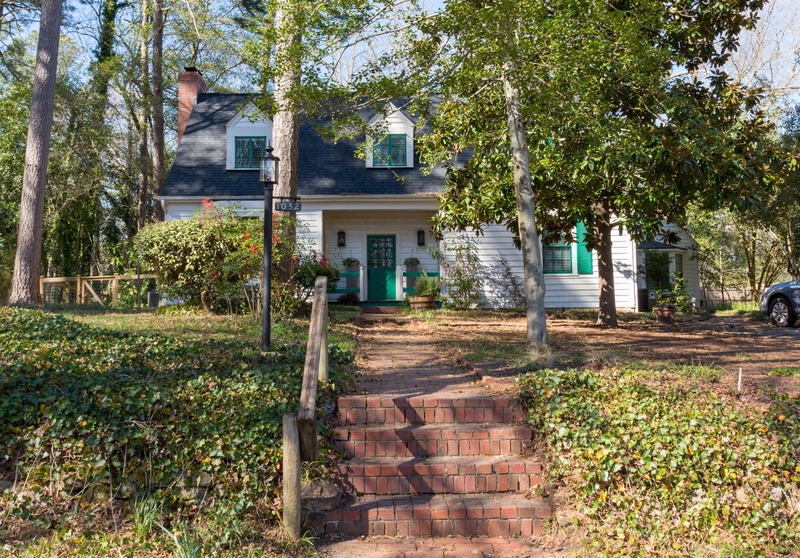 Chas and Mary Skinner lived in their Sycamore Street home until 1967, when they sold it to Ann and William Franklin Reed. Chas Skinner died in 1982 at the age of 63, and Mary died when she was 66, in 1989. Both are buried in Maplewood Cemetery.